Pandoria is the new game from Bernd Eisenstein and me, and as with our previous collaborations, the journey truly is the destination. From it’s…ahem…colorful beginnings to our many brainstorming and playtesting sessions at home and at Berlin’s Spielwiese cafe, I hope you find the story of this game design entertaining, and if this is your type of game, a reason to investigate further. Sure, he had a point. It did happen, there was not much we could do about it, and we had to move out immediately. We would not be able to move back until the apartment had been renovated five months later. The bright side of the story is that we were reminded again that we have some of the most wonderful friends and neighbors, many of whom helped us salvage some of our belongings and throw away the rest, then allowed us to stay in their apartments when they were away on vacation. It was in one of those apartments that Pandoria was born. I dealt with the stress the way I often do: creatively. To get my mind off the mess in our apartment and the impending court battle, and to take a break from making an extensive inventory of our lost and damaged items, I started playing with double-sided hex tiles. As I played, I saw a mechanism of enclosing certain areas of the same color. I immediately saw the potential of using figure placement to score those surrounded regions. When each player placed a tile and a figure somewhere on that tile, more than one player usually scored a closed region, but each player tried to score more than their opponents. But what happened when a figure was inside a region that had been closed? And when did you get your figures back in order to place them again? The answer to both of those questions intuitively presented itself in a single rule: Figures inside closed regions are immediately removed! This opened up other strategic possibilities. I knew early on that I had a fun, very interactive game that sometimes felt semi-cooperative (building a region together that everyone scores) but could also be deliciously nasty (booting someone out by surrounding them before they could score as much on that larger region). 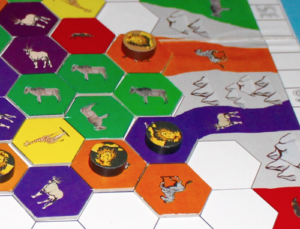 My prototype was called „Pride of the Serengeti“, and it involved lions (the figures) hunting their prey (the different colors on the tiles). As soon as a herd of the same animal was completely surrounded, the lions went in for the attack! I may have been „homeless“, but that did not keep me from my „second home“ — the Spielweise gaming cafe. I brought „Pride“ to my weekly playtest group there and they enjoyed it right away. They also helped me solve the problem of scoring regions on the edge of the board. From then on, the game board had „exit paths“ that matched each color, and if a herd was connected to its exit, it would never be enclosed, and thus never be scored. This also meant that a figure on a region connected to an exit was not removed. This could be a good thing, but it would also reduce the number of your available figures for the rest of the game! This added more strategy and more beautiful dilemmas to the game, while still keeping the rules simple and intuitive. 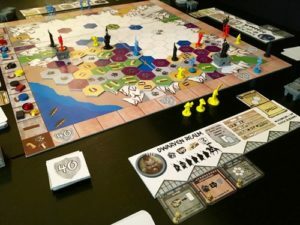 At this point, I felt that „Pride“ was one of my best designs, a game with rules that could be explained in two minutes, yet it had an enormous amount of interaction and strategic depth. I was excited to bring it to the SPIEL game fair in Essen that year. Unfortunately, however, the „family game“ publishers I met in Essen were not interested in it, so I thought about going another route: Using „Pride“’s solid mechanisms as the base for a more complex game. Furthermore, I’m always looking for opportunities to collaborate with Bernd, and I thought that his experience with special player powers and card combinations would benefit the game, so I asked him to join me in building a new game around „Pride“’s mechanisms. Bernd immediately had several ideas that took the game in a beautiful new direction, and from then on, every idea from one of us inspired new ideas from the other. For the past two years, we’ve had a blast constructing and deconstructing this game many times over, and I looked forward to every playtest. Bernd did the lion’s share (hehe) of balancing the cards and I wrote a new fantasy backstory. 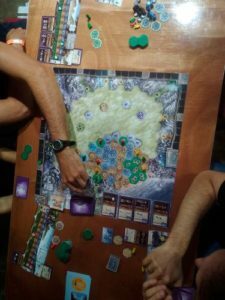 We also enjoyed playing the game together many times before bringing it to the larger group, thus Pandoria has undergone more two-player testing than any other game I have previously designed. With the new fantasy theme, the lions became different realms: the dwarves, elves, halflings, humans and mages (and there will be two additional realms available as well). Each realm would have a unique ability. Bernd had the idea to change the animal herds into different terrain that each yielded different types of resources. We also developed the idea of having rule-breaking cards. The top half of each card had a spell that was a one-time benefit, and the bottom half had a building that provided a benefit for the rest of the game. Each card could be used as only one or the other. The resources were important for the cards: You bought cards with gold, you cast spells using magic crystals, and you built buildings using wood. The fourth landscape type was the cities, and they provided pure victory points. We limited the number of each resource each player could keep to ten. Any excess you scored above that would be „sold“ as victory points at a 3-1 ratio (which could be improved upon by certain buildings). Players could stockpile resources to try to score points, or use them to build an „engine“ in order to score more later — or they could decide that using some of them to cast the perfect spell at the right time was too much of a temptation to pass up. The cards provided more strategic options but still had an intuitive connection to the theme. While gameplay became more complex due to the combinations of the cards, what you did each turn remained simple: Place a tile and a figure, play a spell or build a building if you wish, then all players score a region if you happened to enclose one. The player who closed a region may also buy a new card from the market, which gives someone an incentive to do so, even when other players might score more resources from that region. As the game nears its end, players may also build monuments over other buildings in their tableau. These are worth a decreasing number of points, so the first ones built are the most valuable, but they also nullify the effects of the buildings that are covered. It was never understood that Bernd would publish the game himself, but at one point, he gave me the ultimate vote of confidence in the design when he suggested it could be the next Irongames release. I couldn’t refuse, and I have enjoyed working with Bernd further on the production and additional refinement of the game. We developed a slightly easier beginner’s version, and we are even including a „family game“, which is the original stripped-down rules of „Pride of the Serengeti“ modified to fit Pandoria’s components. So if there are casual players who want something less complex, or you want to finish the game in under an hour, you can play this version of Pandoria! 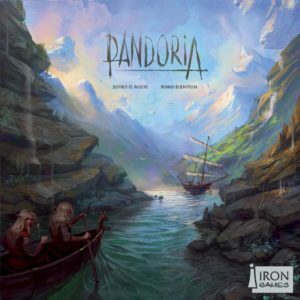 It’s been a long wait, but now I’m looking forward to spending more time at Bernd’s Irongames booth during SPIEL this year teaching Pandoria, the game that first helped me get through a challenging episode in my life, and later became an excuse to spend time with a great friend doing what we enjoy most when we are together — making great games. I have to thank Jeff that he asked me to join his brilliant „small“ first idea. I loved the game from the beginning for its easy rules and deep gameplay and it is always a great experience and fun to work with Jeff. For me then it was no question to release this game under the „Irongames“ sign, because I had no other game ready, of this high quality and that makes so much fun! Will do the best to promote it the maximum way, it deserves.